Aspose.BarCode is a Java based visual component for generation & recognition of 1D & 2D barcodes to support Java and web applications. Aspose.BarCode for Java supports 29+ barcode symbologies like MSI, QR, OneCode, Australia Post, Aztec, Code128, Code11, EAN128, Codabar, Postnet, USPS and also supports image output in GIF, PNG, BMP & JPG formats. Other features include barcode size & color settings, rotation angle & caption. ...... With Aspose.BarCode for Java, developers have full control over every aspect of the barcode image including: background color, bar color, image quality, rotation angle, x-dimension, captions, customer defined resolution and more. Aspose.BarCode can read and recognize most common 1D and 2D barcodes from any image and at any angle. Aspose.BarCode for Java allows you to easily manipulate barcode image borders, border colors, style, margins and width as well as allowing you to modify image color, back color and bar color. You can also rotate barcode images to any angle and produce high quality barcode images with anti-aliasing. In addition to this, barcode image margins can be managed and you can set customized resolutions. 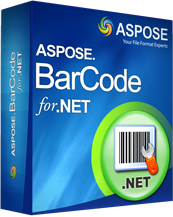 Aspose.BarCode supports barcode generation on Web and Desktop .NET applications. Qweas is providing links to Aspose.BarCode for Java 2.7.0.0 as a courtesy, and makes no representations regarding Aspose.BarCode for Java or any other applications or any information related thereto. Any questions, complaints or claims regarding this application Aspose.BarCode for Java 2.7.0.0 must be directed to the appropriate software vendor. You may click the publisher link of Aspose.BarCode for Java on the top of this page to get more details about the vendor.